I hope you don’t mind that I’m starting out this post with a drawing of the mind that I did not draw. My mind noticed that drawing of the mind on the white board of my fellow psychotherapist, Megan, yesterday. My mind is now doing its best to remember Megan’s explanation of that drawing — I believe it represents confusion on the top of the mind and the attempt to go deeper into the mind, past the confusion. I hope Megan, who reads this blog, does not mind the way I explained her drawing. Because the mind makes connections and comparisons, my mind is now remembering a drawing of the mind I made several years ago (which figured in this old post, if you don’t mind my linking to that). My mind is now noticing that both Megan and I have observed that human beings often have negative and uncomfortable thoughts and experiences on the top (or the front) of their minds and that they have to work hard to get past those. Indeed, my mind has been struggling, lately, to get past negative and unhelpful thoughts including fortune-telling, catastrophizing, mind-reading, comparisons, shoulds, and the other common cognitive distortions listed here (if you don’t mind another link in this post). My mind now has the strange feeling I’ve ended other posts exactly like this before: Thanks to all who helped me create this post and to you — of course! — for reading it. Top of mind is one of my favorite descriptive expressions- it evokes narratives, mostly playful ones in my mind Watching my mother struggle with her mind now that she has had a mild stroke, has required that i readand think more about “top of mind ” and how complex our brains are, how capable and engenious and how much suffering as well as pleasure we experience all buzzing and connecting in “the little grey cells” as Christie’s Hercule Poirot demures . In the rehab where my mother spent five days, there was a big sign that said “perception is reality.” I will leave it there, without expressing my own reaction every time i walked by it. But i will say that i enjoyed your post today and found it particularly relevant to my family life at this time and i thank you. Love you Ann! Love you and your complex and beautiful mind, Carol! Also…. Top of mind to me this morning is the snow outside my window, and not letting my mind run away with grumbly thoughts about SNOW! It’s SPRING! It’s on the top of my mind now to say “Top of the evening” to you, Louise, and to the warmth and light you always bring. Python…really knew how to work a concept ! Thanks for the smiles, Ann. Thanks for this mindful comment! Grahm was one of the geniuses of MP and I hope you don’t mind that I admit that I’ve been focusing on some cognitive distortions that seem to be following me around lately. Time to move on and maybe watch “The Holy Grail” this evening. I don’t mind anything you choose to share, Ray. Thanks for the mindful comment. Sorry that you are feeling anxious these days, Ann. Glad that Aaron is in the perfect place for Aaron. Will he come home this summer? Aaron will be home this summer, Maureen, and I appreciate your sympathetic mind. I have a feeling that I wrote this many years ago. At the time I described my brain as a lump of tripe. Things haven’t changed much! Thanks for the reminder of Monty Python. Thanks for your pondering mind, Peter. Our minds, all our minds, are strange, wonderful places. That’s something I often forget, or take for granted, and I appreciate that you’ve offered a reminder. 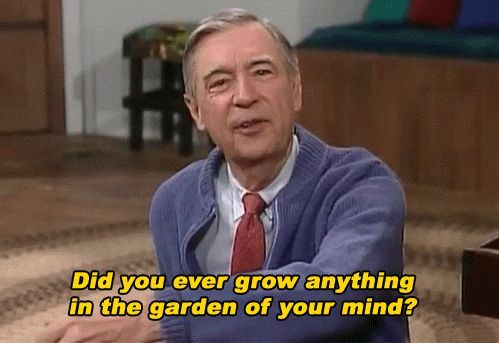 You grow wonderful thing in the garden of your mind, Chris. In my mind, Megans’ drawing looks like a bowl of boiling spaghetti…. Sounds about right! I’m glad you and Aaron are both happy that he is in Edinburgh! I’m glad and happy that you’re here, Val! Do you know how to know when a blonde has used her mind?????????????????? Actually, Megan is a blonde and her mind was the inspiration for this post! I’m sorry to hear you’re experiencing a bit of struggle and wobble lately – I hope it passes quickly for you. When I saw the mind “drawing” I thought about meditation. How thoughts rise to the top and the job is to simply let them go, so there is more and more expansive white space. I love the way your mind works, Deborah. Many thanks. Oh, the teary giggles and wiggling chuckles making the iPad hard to hold straight for me and the Mr to watch! Thanks! Wow. Deja Vu. I never mind your comments, Derrick. The mind can be a most frustrating entity. It appears to have a will of its own. My mind is grateful for the thoughts in your mind, Robert. Ever since I read your post on catastrophizing, I realised that I do all the time, so now as soon as I realises, I laugh and redirect the mind to the present. Thank you. I’ve never seen that particular Monty Python sketch so thank you again! I love your mind , Hilary, and how it’s dealing with catastrophizing!